Our Affair Recovery Counseling services in Oklahoma City include the most successful and proven methods to create our unique approach to affair recovery. We have successfully helped hundreds of couples completely heal their relationship in a little as 12 weeks. Marriage Solutions is a counseling service that is entirely dedicated to couples. Located at 1800 N Shartel Ave in Oklahoma City, OK, the group practice is made up of therapists with specialized expertise in helping couples communicate, trust, and regain intimacy again even after infidelity. While most therapists are generalists, our therapists are razor sharp focused on doing one thing very well: helping couples heal and grow stronger. The Affair Recovery program is lead by practice co-founder, Brad Robinson, a licensed marriage and family therapist, and site manager Randee Tomlinson (also LMFT certified). For couples looking to receive help after the shattering revelation of infidelity, it is worth knowing that this Oklahoma City practice uses research-based methods to achieve excellent results that have generated hundreds of glowing reviews online. The couples’ therapy offered by Marriage Solutions, Oklahoma City mainly involves the couple visiting the therapist. The therapists often provide coaching to international clients, and those who live away from Oklahoma City, if they aren’t yet able to physically come to the offices for therapy for various reasons. There are 3 therapy treatment options. Option one is week-to-week counseling which consists of two or three hour weekly sessions. Option two is 1, 2, or 3 day intensive retreats. The third option is a combination of the retreat and week-to-week counseling. Alongside 1-on-1 therapy treatment options, Marriage Solutions also offers workshops for couples wanting to strengthen their marriage many of them recovering after an affair. Unfortunately, these are fully booked throughout 2017. There may be cancellations however, and because the workshops sold out so fast, there are possibly more in the pipeline. If one partner has left, or refuses to seek help, then it is possible to attend a session alone or choose a coaching call. Marriage Solutions also provides various support materials, including podcasts, Q&A sessions, books, programs, and videos. A coaching call can sometimes be useful for advice on how to make sure a partner will attend the session with you. Couples dealing with the fall-out from infidelity often feel like there is no hope of affair recovery. Infidelity is usually just a symptom of deeper problems, and the person who has been betrayed is often traumatized and angry. Citizens of OKC often times turn to us to have the expertise provided by Marriage Solutions at their disposal. Statistically, 68 – 90% of couples show significant improvement with this particular method of treatment, and 75% find their relationship has recovered fully after only 15 – 20 sessions of treatment. These benefits are usually sustained. Following the affair recovery counseling program, many couples say that their relationship is better than it was before. You do not have to be married to seek help with affair recovery either. All couples are welcome at Marriage Solutions. It is also worth mentioning that where other therapists have failed, the focused expertise of Marriage Solutions has often succeeded. Do not let one ineffectual therapist deter you from receiving help that is proven to work. 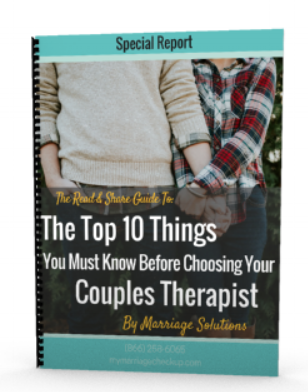 Marriage Solutions has provided online videos that couples can watch to learn about what the therapy will involve. This includes hearing couples who have been through the program talk about what it was like. There are also numerous testimonials in which couples who truly believed that they were beyond help, describe how the Marriage Solutions program saved and even improved their relationships. Often, people are concerned that they will be the ‘guilty one’ or that their partner will not listen. However, what the reviews state repeatedly, is that the therapists can create a safe space in which to discuss the relationship constructively. The EFT (Emotionally Focused Therapy) method is deeply compassionate. Having found this compassion, couples are able to rebuild their bond. Whether you are based in Oklahoma City or not, and even if you think your marriage does not stand a chance, pick up the phone and find out about how Marriage Solutions can help you today. Contact our OKC location today to find out more information. 3. You Will Be Given the Client "Tool Box" Portal Login. There you will find the first day paperwork and many very helpful tools.